1Department of Medicinal and Aromatic Plants Research, National Research Centre, Dokki (12622), Giza, EGYPT. 2Department of Chemistry of Natural Compounds, National Research Centre, Dokki (12622), Giza, EGYPT. 3School of Pharmacy, Nanjing University of Chinese Medicine, Nanjing, CHINA. 4School of Natural Sciences, Nathan Campus, Griffith University, 170 Kessels Rd, Nathan, Queensland 4111, AUSTRALIA. Introduction: High antioxidant capacities have been linked to the treatment of rheumatic diseases and also in the inhibition of microbial growth. Although Cakile maritima has a high antioxidant capacity, it is yet to be tested for the ability to inhibit the growth of the bacterial triggers of autoimmune inflammatory diseases. Methods: C. maritima solvent extracts were analysed for antioxidant capacity by the DPPH free radical scavenging assay. Growth inhibitory activities against bacterial species associated with initiating rheumatoid arthritis, ankylosing spondylitis and multiple sclerosis were determined by disc diffusion assay and quantified by MIC determination. Toxicity was determined by Artemia franciscana bioassay. Results: All C. maritima solvent extracts displayed good DPPH radical scavenging activity, although the ethyl acetate extract was particularly potent with an IC50 values of 3.4 μg/mL. The other extracts also had significant radical scavenging activity, with IC50 between 4.7 and 13.6 μg/mL. The bacterial growth inhibitory activity of the extracts correlated with their free radical scavenging activity. The ethyl acetate extract displayed the most potent growth inhibitory activity against most bacterial species. This extract was particularly potent against Proteus mirabilis, Proteus vulgaris and Pseudomonas aeruginosa (MIC values of 431, 559 and 777 μg/mL, respectively). The hexane extract was also a potent inhibitor of the Proteus spp., (MIC of approximately 500-800 μg/mL). The ethyl acetate extract also inhibited Klebsiella pneumoniae growth, albeit with higher MIC’s (approximately 1500 μg/mL). All other C. maritima extract-bacteria combinations generally resulted in mid-low potency inhibition. All of the extracts were determined to be nontoxicin with the Artemia franciscana bioassay, with LC50 values substantially >1000 μg/mL. A total of 97 unique mass signals were detected in the C. maritima ethyl acetate extract by nonbiased GC-MS headspace analysis. A number of terpenoids which may contribute to the therapeutic bioactivities of the extract were putatively identified. 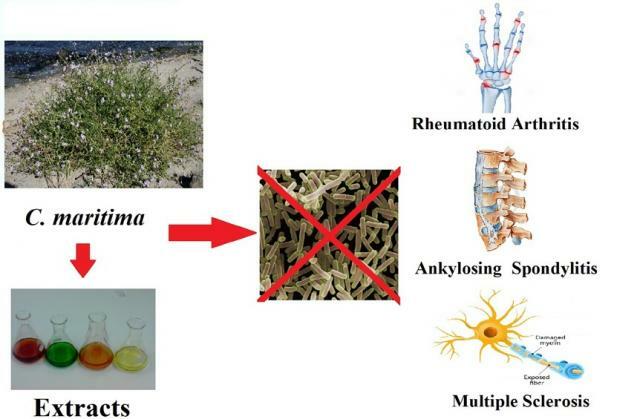 Conclusion: The lack of toxicity and the inhibitory activity against microbial triggers of rheumatoid arthritis, ankylosing spondylitis and multiple sclerosis by the C. maritima ethyl acetate extract indicates its potential in the treatment and prevention of these diseases. Omer E, Elshamy A, Gendy AN, Cai X, Sirdaarta J, White A, et al. Cakile maritima Scop. extracts inhibit the growth of some bacterial triggers of autoimmune diseases: GC-MS analysis of an inhibitory extract. Pharmacognosy Journal. 2016;8(4):361-374.